It's only a matter of time before you start using HTML5, and while some companies just beginning to grasp basics of HTML5, our team has already gained a significant experience coding with this language and in particular converting from PSD to HTML5. The future starts with HTML5! HTML5 is a current version and a new step in HTML language. Converting PSD files to HTML5 and CSS3 is the best choice for those who appreciate excellent user experience. Why to convert PSD to HTML5 and CSS3? HTML5 includes new features such as video, audio, canvas and more tags, as well as integration of SVG (Scalable Vector Graphics) content. Availability of these features helps to effortlessly build multimedia into web, since they substitute 3-party plugins and Adobe Flash. HTML5 boosts consistency across the site. The markup we deliver for HTML5 makes it easier for web masters to see the structure of the page. If you are thinking on creating your site mobile version or an app, HTML5 is a number one for mobile and UI development nowadays with its awesome meta tags and other advantages. What you get if you choose us to implement your project? Coding of our websites is always tidy and 100% manual, so you can be sure that your website will be user-friendly and nice looking. HTML5 is much more clean and semantic, that helps to keep the markup harmonized. Coding pixel-perfect is crucial for PSD conversion. When we transform your designs to HTML we make sure that they look as great as initial mockup on the web. Bold visual content of your web pages will give the site more professional look and user-friendliness. Unlike HTML, HTML5 specs are supported not only by old web browsers but by the new-day ones such as Chrome, Firefox, Safari, IE9 and Opera. Our QA team tests cross-browser compatibility among all popular web browsers as well as cross-device compatibility to ensure proper work of your site for all users all over the world. If your markup is W3C valid it means that your HTML5 documents have passed a markup validation and meet all requirements established and determined by the World Wide Web Consortium. The markups we create meet all coding standards, therefore we vouch for the technical efficiency of every web page we provide. Want people to freely find your site? When Google or some other search engine investigates sites, it dissociates the HTML5 code and the content. What articles to add to the blog or what pictures to post is your business. But we can make pages load quicker and scale-up search traffic. Additional semantics and W3C correspondence of HTML5 make your websites search-engine friendly. Once you've submitted a query, our support managers will assist you as soon as possible. After that, we will discuss your project in detail. Our support team is a group of tech-savvy managers, so you can feel free to ask them all necessary questions and get clear and precise answers. We keep in touch during the entire development process. This way we minimize an opportunity of missing details and can ensure your total satisfaction. 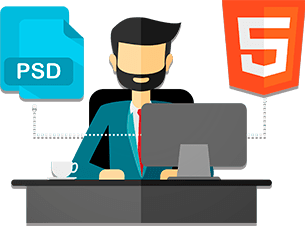 Stages of conversion from PSD to HTML5 and CCS3 are quite simple, so it will not be difficult for you to grasp them, even without technical knowledge. First of all we analyze your query and the files you provide us with. We discuss the overall idea and the requirements of the project with you. Files are getting split into different picture units. Developers start HTML5/CSS3 coding of elaborated files.